Mother arrived here three weeks ago. This year’s most unnecessary-kitchen-things-to-lug-all-the-way-to-England included a microwave idli maker and a sprout maker. I was saved by a stroke of luck. Namely, the miserly baggage allowance of Qatar Airways. This year’s trip is in honour of Mini Basu’s school start. The time my mother has in between school drop off and pick up, she spends dutifully cooking for her sprogs and grand sprogs. She has taken a brief respite from her life on set to do what come most naturally. After all, as a dear friend’s mother declared, Bengali (Bong) mothers are only truly interested in three things: education, food and their children. I can’t say I am escaping this fate either. What better time than now to transport my latest cookbook from the bedside table to the kitchen? I have been chuckling in bed reading this fantastic cookbook by Sandeepa of the very popular Bong Moms cookbook blog. A dear friend, her eponymous cookbook captures the food, spirit and innate humour of the culture we share in a very funny and seminal, contemporary Bengali cookbook. I set my sights on the Bengali Tin Kona Porotha recipe, the triangular paratha, of our childhood breakfasts and Sunday lunches that I pine for in London. Not one to attempt on a regular work day, it was now or never. 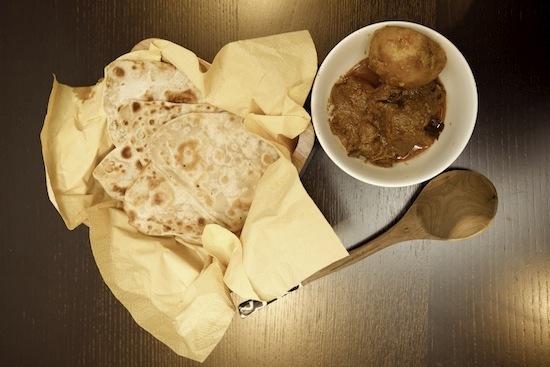 Mother had already cooked Mangshor Jhol, a sublime slow cooked goat meat curry. Now I would pair it with a single minded focus on the step-by-step instructions of another Bong Mom. Except, mine doesn’t do silences. At which point, I decided to give her a job: “Mother can you pour us some gin and tonic?” She was up in a flash. Aided by Bong Mom’s Cookbook, a gin (or two) and mother’s watchful eye, I made a stash of moreish parathas that we ate dipped in Mangshor Jhol. From one Bong Mom to another, there’s always room for new exciting adventures. Bong Mom’s Cookbook will certainly keep me going on mine. In a wide bowl mix together the flours and salt. Rub the oil/ghee into the flour with your fingertips until crumbly and then mix in the warm water about a tablespoon at a time, mixing until you get a dough. Sandeepa says, you can mix in a bit of flour if it’s too watery. Next, knead if your life depends on it. I remember from watching our cooks in Kolkata that you would end up with a slippery dough, really pliable, that just bounced right back when punched. This takes a good 20 mins if you have weak biceps like mine. Also, this is a recipe that calls for elbow grease – leave the dough hook in the cupboard. When the dough is ready as above, roll into a long sausage and break off even, ping pong sized dough balls. Cover the bowl with a damp tea cloth and leave to sit for 20 minutes. When the time is up, take a dough ball, dip into the plate of flour and flatten into a disc with your palms. Next roll out to 3 inches diameter and add a drop of oil. Then fold in half into a semi circle,then another half into a triangle. Now with a rolling pin, roll out each edge to form a triangle shape. This is easier than it sounds, and you can always cheat by patching/folding etc. Finally, bring a tawa or heavy bottomed frying pan to heat. Slap the rolled out porotha on it, wait until bubbles appear then flip over drizzling a few drops of oil on the edges of the pan. As the porotha sizzles up, flip over and repeat. Then remove when the spots are darker onto kitchen rol and keep covered until you repeat with the next dough ball. This was a first attempt and in no time, I was rolling and cooking at the same time. Even the shapes got better by go 3-4! In Sandeepa’s words: You get into the groove! This tin kona porotha is lovely with Aloo Chechki. See what you think. 😀 A big thanks to your Mom and how dare you open a book and follow bookish recipe when Mothers are around. The very thought gives me the heebie-jeebies. Love your blog. And loved this post too!